Raymond Goldie of Salman Partners expects uranium spot prices to rise from now until early 2018. “We refer to the day when security of supply becomes of concern to producers as the ‘pinch-point TM.’ We expect to reach the ‘pinch-point TM’ by early 2016, by which time we expect utilities to feel compelled to begin signing long-term contracts in order to ease concerns about security of supply, with those concerns – and spot prices – peaking in Q1 2018,” Goldie states in the report. Goldie told the Investing News Network that over the next three years, prices will move up to the $80 to $85 range before easing to around $70, as previously shuttered mines come back online. “The best cure for high prices is high prices,” he pointed out. China continues to increase its uranium market share, strengthening its nuclear partnership with France last week and entering into a new nuclear cooperation agreement with the US this week. The bilateral nuclear cooperation agreement replaces a previous version that was due to expire at the end of 2015 after it was enacted in 1985. The direct economic benefit to the US is expected to be between $70 and $140 billion from now until 2040, according to Daniel Lipman, the Nuclear Energy Institute’s vice president for suppliers and international programs. Uranium Resources (NASDAQ:URI) announced this week that it has closed its merger with Anatolia Energy, meaning that the integration of the two businesses is now underway. The merger will help Uranium Resources move forward at its Temrezli ISR project, where development is expected to commence in 2016. “With this transformational merger now completed, we now turn our immediate attention to completing the permitting process for the high-grade, low-cost Temrezli ISR project, and moving into development during 2016. The more we study Temrezli, the more confident we are that this is one of the best undeveloped in-situ recovery uranium projects in the world,” Christopher Jones, Uranium Resources president and CEO, said in a press release. Uranium Resources also sold off some of its non-core assets this week to Laramide Resources (TSX:LAM,ASX:LAM). The two companies entered into a binding letter of intent that will see Laramide acquire the Church Rock and Crownpoint projects in New Mexico. “We are pleased to introduce the Church Rock and Crownpoint group of properties as a new cornerstone asset cementing our strategy of developing low-cost uranium assets in tier one jurisdictions.Church Rock complements our flagship asset in Australia, Westmoreland, and our conventional hard rock projects in New Mexico and Utah, being a near term development asset,” Laramide President and CEO Marc Henderson said in a release. 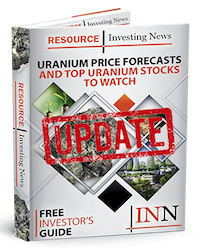 Forum Uranium (TSXV:FDC) announced that plans for a 2016 winter drill program at its Highrock project are underway following the receipt of positive results from gravity surveys. “The proximity to the Key Lake mine, the strength of the conductive trend which we interpret to be the same basal graphitic unit that hosted the 200 million pound Key Lake uranium deposit and the quality of the gravity lows make this a high priority, near surface target for exploration,” Forum Vice President of Exploration Ken Wheatley said in a release. Meanwhile, Kivalliq Energy (TSXV:KIV) received results from soil samples collected from the Dipole-RIB trend and from rock samples from the Yat target area of its Angilak property in Nunavut. Editorial Disclosure: Forum Uranium and Kivalliq Energy are clients of the Investing News Network. This article is not paid-for content. Saskatchewan Canada has uranium! your thoughts?